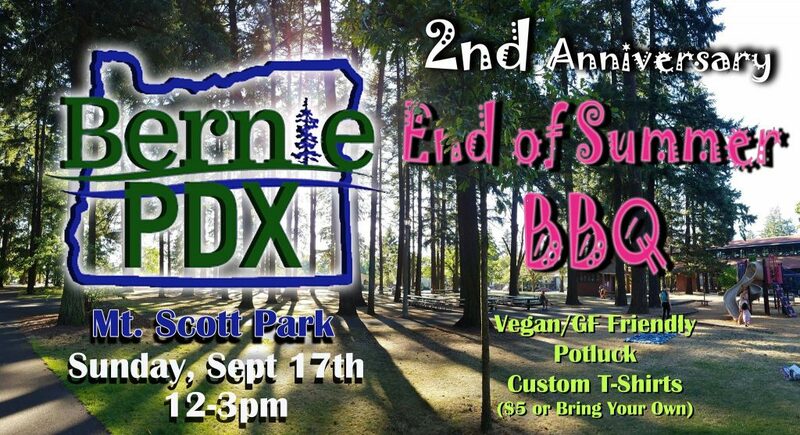 Sunday, September 17, 12-3pm: BerniePDX 2nd Anniversary End of Summer BBQ! Please join BerniePDX for our 2nd Anniversary & End of Summer BBQ Potluck! It’s a great way to plug back in to the local movement, get involved for the first time, or celebrate with community! Two of the candidates BerniePDX has helped elect to local office will be present: Rita Moore (PPS Board) and Valdez Bravo (PCC Board) will briefly talk about the beauties and challenges of running and winning as a progressive and how we can continue Bernie’s Political Revolution here in Portland. For two years BerniePDX has provided a space to learn about and engage in important issues that impact our community and our country. We have much to celebrate: helping elect 6 progressive candidates, helping pass 2 ballot measures, building community, activist & organizer trainings, rallies, phonebanks, canvasses, debate parties, and more! We can’t wait to celebrate our 2nd anniversary with you! Please share & invite your friends on Facebook! Special thanks to 47th Ave Farm for the produce and Tea Chai Te and Dr. Kombucha for donating kombucha and iced tea! We’ll be making custom BerniePDX shirts! Bring your own or $5 to buy one there. ** BerniePDX is an all-volunteer, grassroots organization. We have no budget. Please consider bringing a few dollars to donate to the event, though it’s not required to attend, eat, and enjoy. BerniePDX endorses Theresa Kohlhoff and Neil Simon for State Representative to fill Ann Lininger’s seat in House District 38. Theresa and Neil have a good handle on the issues that BerniePDX believes are most important for Oregonians. They are in favor of raising corporate taxes to pay for essential public services like education and healthcare. They support Single-Payer Medicare-for-All, enacting campaign contribution limits, and lifting the statewide pre-emptive ban on rent control. Theresa, a Lake Oswego City Councilor, handily won her seat in a contested race without compromising her progressive values. Neil has been involved in politics for many years, from the local to international level. We are confident that if appointed, either candidate would be able to keep their seat in the legislature against a Republican opponent in the 2018 election. We encourage the Precinct Committee Persons in HD-38 as well as the Multnomah and Clackamas County Commissioners to vote for Theresa Kohlhoff or Neil Simon.